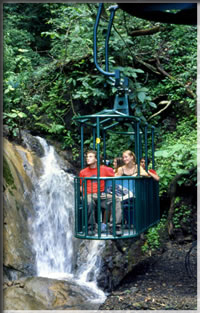 Aerial Tram and Exhibitions Tour at the Gamboa Rainforest. Upon arrival our representative will meet assist and transfer you to your hotel. Balance of day at leisure. Breakfast. Guided trip to the most important places and characteristics of Panama. You will have a pretty good vision of Old Panama City, the Colonial or "Casco Viejo" and the modern areas of Panama.Walk around Old Panama City, destroyed by pirate Henry Morgan in 1671; buy souvenirs at the Handicrafts Market there. The tour continuous to the traditional and commercial areas, banking area, and the modern Panama City, follow by a visit to the Colonial area or "Casco Viejo" through the stretched streets, plazas and public parks, where still conserve part of our history, as France Plaza, Las Bovedas, San Jose Church , with it's wonderful altar (all made of gold), the Flat Arc, and Cathedral Church, as others. Also, you will appreciate the biggest engineering structure of this century, considered the "Marvel of the World Number 8". Learn about it's function and history. You could see the vessels as they transit through the Miraflores Locks at the Panama Canal. Return to the hotel. In the afternoon transfer to the Gamboa Rainforest Resort (45 minutes approx), an unique combination of luxury and exuberant natural beauty. The resort lies on the banks of the historic Chagres River, on the Panama Canal. This package was specially designed for those families looking for an exciting and adventurous vacation. Well known for its Canal, Panama is one of the best-kept secrets for extraordinary adventure. Experience this fascinating combination of a cosmopolitan city, beach and the rain forest, all in one package. The Panama Canal, tropical rain forest, world class deep-sea fishing, shopping, beaches, Indian cultures, Spanish fortresses, colonial ruins, fine restaurants and hotels and Panama's friendly people, make Panama a surprisingly easy country to visit. Discover the secrets of the upper forest canopy with a ride on the Resort's aerial tram The tram takes you from the shadowy forest floor through the under story and into the sun-drenched canopy KIDS STAY FREE!